Britney Spears shows a comic flair as the giggly, nervous receptionist Abby on the March 24 episode of "How I Met Your Mother" on CBS. The ShowBuzz brings you a sneak peek of the pop star's appearance on the show. 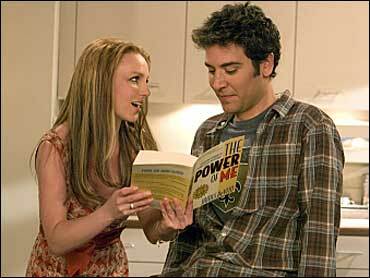 Spears will portray a wacky receptionist in love with Ted (Josh Radnor) in the episode. Unfortunately, Ted is in love with the receptionist's boss, a doctor played by "Scrubs" star Sarah Chalke. Video: Britney On "How I Met Your Mother"
During the show, the receptionist undergoes a transformation of sorts. "Initially, she's wearing glasses and (is) a little mousey and, as she develops this crush, she gets a little foxier, tries to impress me," said Radnor.